Will you be sneaky enough to become the richest corsair? There was a time when the Caribbean islands were an El Dorado traveled by trading ships carrying great wealth. The corsairs of these blue waters infested with sharks reigned supreme. 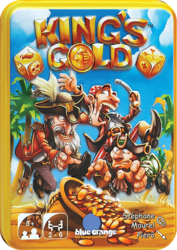 You are one of these corsairs and you will try to amass a maximum of gold coins, even if you want to betray the King himself!